The sound of flowing water is something that cannot be replicated. Even a recorded video of flowing water pales in comparison to the real-life experience. That’s why people travel far to visit natural waterfalls and ponds. But, what if this soothing sound could exist right outside your home’s walls? At Topaz Design, we bring the tranquility right into your backyard. It has been scientifically proven that the sound of flowing water provides meditation and relaxation. The sounds of these outdoor features not only soothe the mind, but they are also beautiful to the eyes. Designing and installing these water-filled dreamscapes for many years, our experts at Topaz know how to position your water feature to command the most attention and visual appeal. Our ponds and waterfalls beautifully enhance your inground pool. They are also an extraordinary extension to any outdoor living space that you currently have in your yard. Ultimately, our water features give your outdoor sanctuary new dimension, while harmoniously blending in with the rest of your homescape. These additions also significantly increase property value, and set your outdoor space apart from all of those around you. 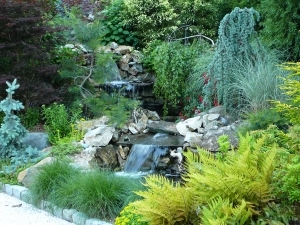 Ponds and waterfalls can take an ordinary yard and turn it into something truly extraordinary. To begin your water feature project with Topaz Design Group, complete our online form today and our team will be in touch.